Just look at her transform! Maple the young Pit Bull was found under an overpass located in Tehachapi, California by animal rescuers. 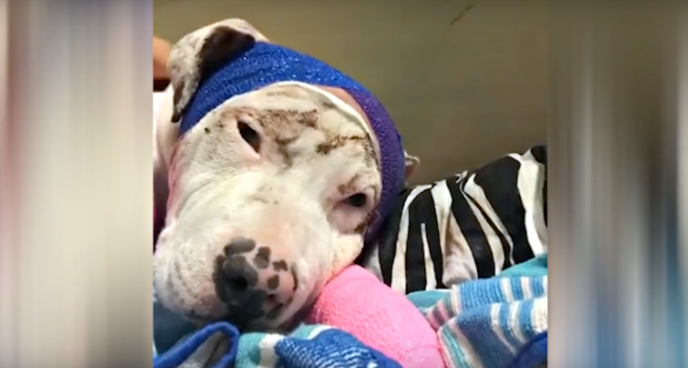 She was found to have sustained multiple severe lacerations and puncture wounds, which proved that poor Maple was most likely, a bait dog and mauled by other dogs. Maple was placed under the care of staff at Kern County Animal Services. Her story earned the attention of a man named Zach Skow, who was also the founder of Marley’s Mutts, a non-profit organization aiming to help dogs in dire need. Zach knew that Maple was in a rough state, and that he had to help no matter what. Maple was constantly howling and whining in pain due to the severity of her injuries. Zach kindly took over, and brought Maple to get proper medical treatment and while fostering her himself. After a month, things started to look better for the Pit Bull. 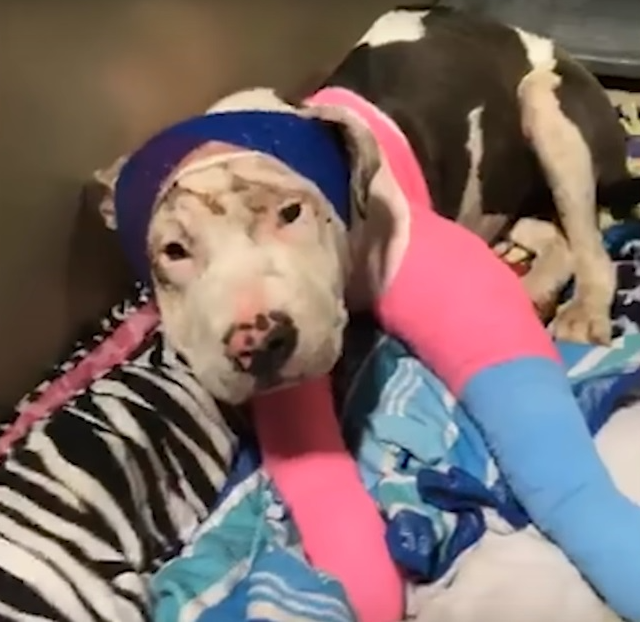 Even though Maple’s flesh wounds have started to heal day after day, she hardly met anyone with no thanks to her breed’s negative stereotype – it deterred many people. Zach considered what the poor dog had been through, physically and emotionally – he decided to help find her a loving home which she deserved. To do so, he contacted his friend, Rocky Kanaka. Rocky had an idea to hand-build a special butterfly kissing booth, with Maple wearing a theme-matching costume which reflected her bright personality – it was to help her meet potential adopters. Maple had the time of her life, getting pampered at a dog spa and was very eager to meet new people in her special rainbow butterfly costume. Generous sponsors even worked together to supply her new adoptive family dog care package – everything that Maple would ever need to be lovingly cared for! Today, Maple has been successfully adopted – thanks to the people who cared for her well-being! The post Former Bait Dog Wears Costumes Over Wounds —As Confidence Boosters appeared first on weloveanimals.me.